iTunes Gift Cards are the perfect gift for anyone who enjoys one-stop entertainment. 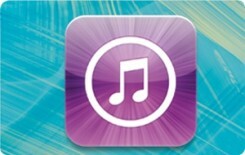 Each iTunes store card/code is redeemable for music, movies, TV shows, audiobooks, games and more. Recipients can sync to their iPod or iPhone, burn music to CD and watch or listen on their computer - Mac or PC. iTunes is a registered trademark of Apple Inc., in the U.S and other countries.